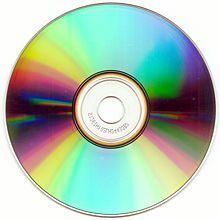 A Compact Disc, also called a CD are small plastic discs which store and retrieve computer data or music using light. Compact Discs replaced floppy disks because they were faster and could hold more information. The CDs made floppy disks to become wikt:obsolete. CDs were invented by both Philips and Sony at the same time, but not together. Sony and Philips did work together to create a standard format and the technology to read CDs in 1982. CDs can hold up to 700 MB worth of data, which is about 80 minutes of music. Mini CDs were also made for special small programs like drivers. CDs that have computer information on them are called CD-ROMs, or Compact Disc - Read Only Memory. The diameter of a normal CD is 120 mm. The middle hole in a CD is about 1.5 cm). Wikimedia Commons has media related to Compact disc. This page was last changed on 20 January 2019, at 12:22.